Sarma Melngailis's Veggie Girl Power Interview! Sarma Melngailis is the Co-Founder of NYC raw vegan restaurant Pure Food and Wine and Founder of One Lucky Duck (online store/raw snack brand/juice bar/takeaway). "Raw Food" (kept below 118 degrees) may sound like a quirky diet trend to the newbies out there, but raw vegan food is actually a lifestyle. Sarma's company slogan says it all, "Eat Raw Live long." If you think raw food can't be classy, modern and mmm-out-loud delicious, snag yourself a reservation at PFW (when in NYC). You won't regret it. My PFW Bliss. The first time I dined at PFW with my non-veggie husband, he kept asking, "Wait, are you sure this vegan?" He thought the cheese was dairy cheese and he really had no idea what some of the savory and gourmet ingredients were, but the bottom line was that he loved it! With a forkful of Zucchini and Local Hothouse Tomato Lasagna, a glow of pure bliss on my face, I assured him, "Yes, this is vegan, and it's raw!" Sarma: Veggie Girl Power! How can you not love her: She's running the show at one of the most innovative and progressive restaurants in the city (really, the world). She has authored and co-authored two raw vegan books. She's in constant raw food bliss: a green shake here, a mallomar there, a few raw snacks in between. She writes an addictive and informative blog about her raw-foodie-life. She made a twitter account for her adorable kitty cat. And she has that nifty "signature Sarma" duck tattoo of her One Lucky Duck logo on her shoulder. Though I've never met Sarma personally I've seen her a few times while dining at PFW. I always want to run up to her and shout "You rock!" But alas, that's not really my style. Just seeing Sarma there gives the dining room a warm vibe. My rule of thumb for dining: you can judge a restaurant by how often the owner or 'celebrity chef' brand name dines or hangs out there. It's clear that Sarma is a hands on leading lady - she lives, breaths and eats the PFW/OLD brand. Gourmet Raw Food. Anyone who has dined at PFW, located in the Gramercy Park neighborhood of Manhattan, knows what a unique establishment it is. Sarma has effectively taken "raw food" and given it the 'fine dining' 'gourmet' treatment. PFW, which opened its GramPark doors in June 2004, is a far cry from what raw food was just a few years ago. And it may not even be what you expect today. On the menu you will find 'Dr. Cow Tree Nut Cheeses' 'White Corn Tamales with Raw Cacao Mole' and 'Morel Mushroom and Hempseed Burger with Manna Bread and Pickles'. And guess what, there is absolutely no tofu, tempeh or seitan anywhere on the menu or premises. That's right, no tofu. Sarma Melngailis, Co-Founder of NYC raw vegan restaurant Pure Food and Wine, Founder of e-commerce store, takeaway store, and raw snack brand One Lucky Duck (oneluckyduck.com), co-author of Raw Food Real World (Harper Collins 2005) and author of Living Raw Food (Harper Collins 2009). Sarma:First I go for water with lemon or lime. Then juice. Right now I’m all about these juices we make and bottle each night at the restaurant using a Norwalk press juicer. My favorite is called Swan Greens. It’s cucumber, spinach, and dandelion greens with a little grapefruit, pear and a touch of tarragon, spearmint, and yuzu. I mix in some thawed E3-Live, and sometimes some Vitamineral Green powder, and then a few drops of liquid stevia to sweeten it some more. I’m hooked. If I don’t have this in the morning I feel completely deprived. Later on when I get hungry again, I go for One Lucky Duck chocolate or vanilla crispies with hemp milk and a sprinkle of raw cacao nibs and a few goji berries. It’s a good energy wake-up cereal. Yummy. Sarma: Thank you! I didn’t have any specific person that was consistently inspiring, though there were a lot of people I found inspiring in various ways. I think I get more inspired by Richard Branson than anyone else, but that’s not to do with raw or vegetarianism, of course. He’s more my inspiration for how I want to build my company, and change the world. He reminds me that it’s okay to go against the norm, to make things fun, and to want to pursue projects or ideas that some people may think are crazy. When someone calls me crazy, it only boosts my confidence and determination. Sarma: It started out as an experiment that became permanent after I experienced feeling SO much better, and reading everything I could get my hands on in the area of going raw and vegan. My favorite book of all time on going vegetarian/vegan is John Robbins’ Diet For a New America. I love love love that book. I wish that book could be read by junior high and high school students everywhere, so they at least have some better facts with which to make up their own minds about how they’d like to eat. It’s a beautiful book. Sarma:I’m in my own restaurant so much and I love it there. But if I was going out to celebrate something really special, my number one destination right now would be Blue Hill at Stone Barns. Everything about that place is lovely. It’s not a vegetarian restaurant but my friend Dan Barber does amazing things there, and they will of course do vegetarian or vegan if you ask for it. Sarma: My favorite juice right now is the one I mention in my first answer above. I’m lucky I don’t have to make it myself! I’m also hooked on green shakes. I have a recipe online… It’s kind of long to print here. Otherwise, I also love simple cucumber and mango with a tiny splash of vanilla, chilled with ice. It’s thick and filling but not heavy or too sweet. Sarma:I’m pretty sure I could survive without watermelon in the summer, but it would be a huge drag for sure. I think without greens I’d go nuts. I always want dark greens and lots of herbs. I’m a freak for parsley and cilantro. And I love macadamia oil… that’s my favorite oil to use. It has so much flavor. We carry it at oneluckyduck.com. I also love these mallomars we make in our takeaway. Sometimes I have them for breakfast (after my juice). I’d also really miss coconut butter if I couldn’t have that. And One Lucky Duck ice cream. It would be sad to have no more of that. Sarma: Good question. Is it lame that I can’t think of anything? I’m not one of those people that tosses out quotes very often. My own personal favorite quote is one I can’t really share. Or, it would sound all wrong if I didn’t explain why I like it, and would take too long to explain. But one of my other favorites came to me from my friend Dhrumil who always tweets good quotes. “As long as you don’t forgive, who or whatever it is will occupy rent-free space in your mind.” (Isabelle Holland). That one resonated with me because it’s something that took me a while to learn but it really is so much more freeing to let things go, than hang on and stew. I also like our “Eat Raw Live Long” T-shirts and slogan. I liked it so much that I trademarked it years ago. I think I like it because in big letters on our T-shirts it looks really bold. I’m actually wearing one now! Sarma: For sweets, I think the Milk-Chocolate Mousse Layer Cake is one of the yummiest. But it’s hard to choose. (Of course, it’s not really milk chocolate). That cake is so yummy… we put it with vanilla and chocolate ice cream and chocolate sauce. For something easy and savory and summery, one of my favorites also from Living Raw Food is the Heirloom Tomato, Fennel, and Avocado Pressed Salad with Caper Dressing, Pistachio, and Mint. OH wait. Now I think one of the yummiest recipes might be the Spicy Thai Lettuce Wraps with Tamarind Dipping Sauce, or the Zucchini and Heirloom Tomato Lasagna with Basil-Pistachio Pesto, Tomato Sauce, and Pine Nut Ricotta. Those are classics from the first book and both still on our menu. Can you tell it was hard for me to pick just one? Sarma: Again, hard to limit it to just one thing! But I always try to convey to people that with raw food, it doesn’t have to be all or nothing. So many people dismiss it entirely because they think they have to turn their life upside down or it’s just too hard, and that if they’re not 100% perfect, why bother. But it’s perfectly okay to just shift. As long as it’s in the direction of better food that makes you feel better. Sarma: Immediately I thought of Chloe Jo Berman. Because she just seems like a super glam super-vegan-woman. She’s so glam she’s almost like a Barbie doll of herself. I admire that she’s totally outspoken, that she carries herself with so much confidence and style, and that she works to bring vegan information to people in a fun and useful way through her newsletters. (girliegirlarmy.com). From her I learned where to find some fierce vegan shoes when I needed shoes for a party. Shopping is definitely not my expertise. Sarma: YES!!! Yes yes yes. I’m eternally optimistic about everything, but that aside, I definitely think we’re moving in that direction and it’s pretty exciting. Even if people aren’t all vegan, I think people are shifting and will continue to shift towards simply eating far less animal products, or at least those more naturally and humanely raised, which isn’t as destructive for the environment. Of course, there are a lot of forces and a lot of money behind keeping people eating crappy factory meat and pasteurized dairy, and junk food too… but I’m always convinced the good guys will ultimately win. 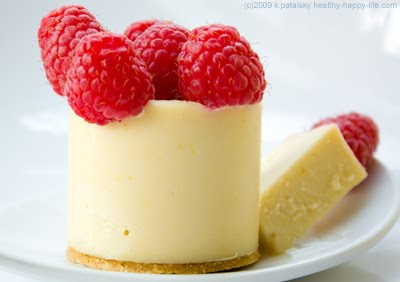 One Lucky Duck Lemon Raspberry Cheesecake. Don't miss the Veggie Girl Power wrap-up post.."Best of VGP.." later this week!